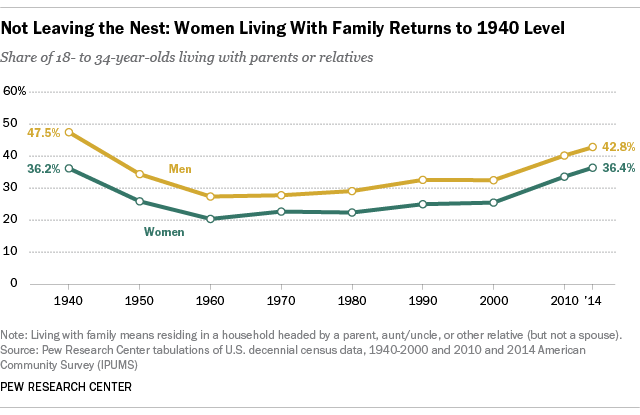 A larger share of young women are living at home with their parents or other relatives than at any point since the 1940s. A new Pew Research Center analysis of U.S. Census Bureau data shows that 36.4% of women ages 18 to 34 resided with family in 2014, mainly in the home of mom, dad or both. The result is a striking U-shaped curve for young women – and young men – indicating a return to the past, statistically speaking. Back in 1940, 36.2% of young women lived with their parents or relatives. That number dropped over the next couple of decades as marriage rates increased and women began joining the workforce in larger numbers, becoming financially able to live on their own. Young adults were most likely to live independently of family around 1960, when just 24% stayed in the nest. But that figure modestly increased from 1960 to 2000 and then sharply increased after that, especially with the onset of the Great Recession in 2008. The labor market recovery since then has not reversed the trend – in fact, it’s become even more pronounced. The reasons that more women today are living with mom and dad are far different from in the 1940s: Today’s young women are more likely to be college educated and unmarried than earlier generations of American women in their age group. In the decade that brought the country into World War II, women typically lived with their parents until they married and only a small share attended college. Indeed, even in 1960, only 5% of 18- to 34-year-old women were college students. Today, women are five times more likely to be enrolled in college. According to 2014 figures, 27% of young women were college students. College students – including those enrolled part-time and at community college – are significantly more likely to live with family than young adults who are not in college. In 2014, 45% of young females in college lived with family, compared with 33% of young females not in college. Furthermore, while marriage typically promotes living independently of parents and other relatives, many young women are delaying marriage compared with earlier decades. In 2013, young women were half as likely to be married (30%) as young women in 1940 (62%). Census figures show that in 2014, the typical woman began her first marriage at age 27. In 1940, it was 21.5. Remaining in the nest is also a trend for young men – in fact, even more so when compared with their female peers. Last year, 42.8% of young men lived with their family, a higher share than women but not one that surpasses the highest rates on record like the women’s share does. In 1940, nearly half (47.5%) of male 18- to 34-year-olds lived with family. Why? It’s likely that the lingering effects of the Great Depression may have contributed to the high level of male co-residence with family. The national unemployment rate for those ages 14 and older in 1940 was nearly 15%. By comparison, the national unemployment rate (for those 16 years and older) peaked during the Great Recession at 9.6% in 2010. Note: The Census data used in this analysis do not classify college students living in dormitories as living with their parents. Such students are classified as living in group quarters and living independently of family. You can download more detailed age breaks here (.xlsx) on young women and men living with family from 1940 to 2014.